This is one of the most common questions we get. Tell us about the Glycemic Index, how does it work, what’s it all about? The glycemic index is a measuring system that tells you the effect certain carbs have upon blood sugar responses. Some carbs have a dramatic impact on blood glucose, while other “good carbs” have a significantly reduced impact on insulin, which has several potential health impacts (not the least of which is hunger pains & weight loss). Technically, the glycemic index (GI) has nothing to do with the actual dosage of the food. These aren’t calories we’re measuring or fat, it’s a ‘type’ of food and it’s predisposition to spike your blood insulin. Why Do We Care and How Can We Use This for Health or Weight Loss? Let’s il lustrate this with a simple example. When you ingest a meal consisting of high glycemic load foods, such as enriched flour pasta (I’m guilty of this all the time unfortunately) – within minutes your body reacts to the specific type of carbohydrates. Unlike low GI foods (like highly grainy steel oats and some types of vegetables), the only way your digestive system can break down the net high GI carbs is to release a sudden and high spike of insulin to combat the blood glucose. That spike of insulin causes a chain reaction. Every time… The immediate impact is your blood sugar spikes way high (breaking down the past), and is then counteracted by the insulin, which then plunges your blood sugar the other direction south… The result is feeling lethargic and dead tired, especially if you ingested a large amount. Can I Just Follow the GI Levels on Food for Success? To a point, yes. You can lookup foods glycemic index levels (like we have on our glycemic index food list page) and generally try to adhere to foods that are low on the GI scale, and only moderately use foods that are ranked high. Meat, fish, and poultry are carb free so you won’t find them on the list. Keep in mind like any system, it’s not absolute. 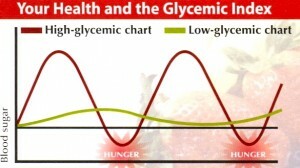 The glycemic index was designed to measure the impact of blood sugar from carbs. You WILL see oddities in the chart, such as some types of cereal (even some otherwise sugar cereals) that have a lower GI than some vegetables that just happen to have a higher than expected GI (like carrots). We’re certainly not advocating you avoid all carrots and eat the junky cereal just because of the GI levels. Use this as a general guide, but the premise is sound. Unlike some other less rationale programs (Atkins comes to mind, since it has less insights on ‘types’ of carbohydrates) the GI program can and has worked really well for a lot of our readers. Take a moment and read through the findings, and explore with the food options to get started — we think you’ll like what you find and there are some eye opening food choices!